The Roman Catholic church in California has settled a lawsuit brought by alleged victims of sexual abuse by clergy members. The diocese of Orange County has come to an agreement on compensation for 87 plaintiffs after two years of talks. Although the actual amount was not disclosed, an unnamed source told the Associated Press that the figure exceeds $85m (£44m). That sum was awarded to over 500 plaintiffs in Boston two years ago. The settlement is likely to influence the amount that may be paid to thousands of plaintiffs in pending cases in Los Angeles and elsewhere. "I want to take this opportunity to again extend on behalf of the Diocese of Orange and myself a sincere apology, a request for forgiveness, and a heartfelt hope for reconciliation and healing," Bishop Tod D Brown, whose diocese serves more than a million Catholics, said in a statement. A lawyer for those bringing the case said no amount of money would replace lost childhoods and teenage years. "But this settlement will give them all the ability and opportunity to conclude their claims and help them move on with their lives," said Ray Boucher. The decision represents the first group settlement of nearly 850 clergy molestation lawsuits pending against the 10 dioceses and two archdiocese in California. The largest number of claims are pending against the Los Angeles diocese, with nearly 500 lawsuits. 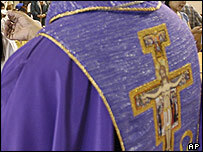 The child abuse scandals, which surfaced in Boston in January 2002, have threatened the Roman Catholic church in the US and beyond. Two dioceses have been forced to declare themselves bankrupt because they cannot afford to meet the claims of all those who say they were abused.